Social Networks and Blogs by Lori Hile. A Mastering Media Book. Review: We live in a media world, and everywhere you look social media surrounds you. Teens spend a bulk of their time texting, chatting on Facebook, and counting their followers! Social Networks and Blogs by Lori Hile explains the basics of using social network sites and texting which is really helpful to people that want to know how to appropriately and safely use social media sites. It also talks about Wikipedia and YouTube. Social Networks and Blogs is organized into different topical sections so readers can easily navigate to the topic of most interest. It provides helpful tips on everything people need to know for using any websites or texting device. Not only does Social Networks and Blogs provide the basics about various sites, but it also addresses safety and consequences for texting and using various sites. Reading this book helps people understand that some websites like Facebook and Twitter have other benefits too because they can help people get instant information on nearly every topic. Twitter in particular has been known to help followers in dealing with natural disasters. 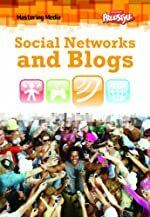 All in all, Social Networks and Blogs is a really helpful book about the Internet and technology. The only point with which I disagree is the use of Wikipedia as a good source for research projects. They didn't mention all the dangers of using a site like Wikipedia such as the inaccurate information. But in a world where teens are surrounded by media, Social Networks and Blogs is not only informative, but it is also high-interest. To find out all of the tips and tricks of using the Internet go read Social Networks and Blogs by Lori Hile! We would like to thank Media Masters Publicity for providing a copy of Social Networks and Blogs for this review. Have you read Social Networks and Blogs? How would you rate it?